Dabrowski's Streets of Rogue instantly reminded me of The Escapists and The Binding of Isaac, and I mean that in the best way possible; the elements of those franchises that I loved are present here, wrapped up in a unique bundle. 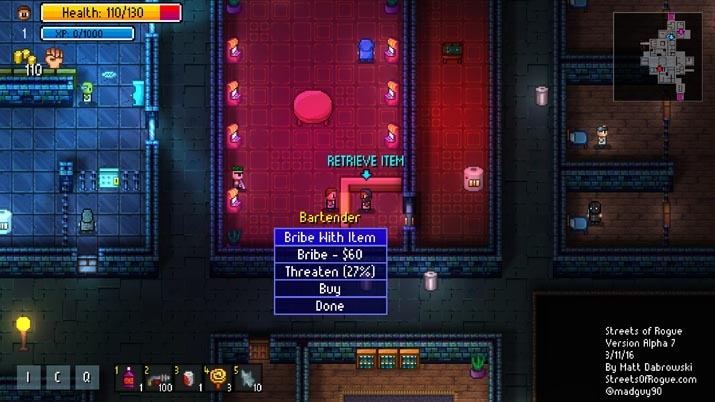 Streets of Rogue boasts more free-form, RPG-hybrid gameplay, offering a vast lineup of character options (each with unique abilities and different starting gear) and ability bonuses that can be selected as you level up during the missions. I started with the Gangster, which allowed me to summon AI companions to help in combat, and offered me the flexibility of using a boombox as a decoy in a pinch. I later switched to the Thief as my primary choice, after one of the Daily Runs prompted me to use that class type to complete my challenges. Players can unlock additional characters by filling certain requirements, such as destroying a bunch of tombstones, stealthing a mission without ever being detected, or freeing a gorilla from its cage. I was surprised to see so many options immediately available in an Early Access title, and I hope that means we'll continue to see more added as Streets of Rogue progresses through new updates and versions. The assortment of character types also adds an extra dimension to multiplayer gameplay, since players can choose to combine similar styles or cover all of their bases with a diverse team of co-op toons. 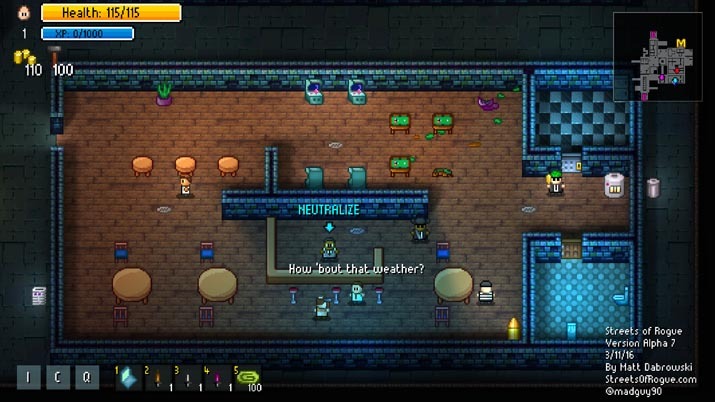 As with other series, like The Escapists, Streets of Rogue offers numerous ways of solving fundamental problems. Players can opt to go head-to-head with AI opponents via combat – and there are plenty of nifty weapons to find and use against each other in the levels – or you can get sneaky and creative in overcoming your obstacles. Since the levels are procedurally generated, with dozens of denizens to serve as enemies (and allies), the experience changes across levels and between playthroughs. That lends tremendous replay value to any saga, and I can see myself and my gaming crew revisiting Streets of Rogue many times due to that degree of fresh, new combinations. Streets of Rogue is an Early Access title, so I tolerate persistent bugs and glitches, since these games are still a work-in-progress. Such is the case here, with the multiplayer experience significantly diminished by complications involving accessing servers, hosting lobbies, finding friend's games, and even staying connected to a server after play begins. In every single co-op experience I've had, I've encountered an issue where players connecting to the host de-sync and have to reconnect, thereby starting over from scratch. I experienced this when I wasn't the host as well, and none of our combinations or server settings seemed to impact this issue. It's incredibly frustrating when you're having a blast with friends, only to run into these hang-ups time and time again; however, the fact that my team continued to play despite having to disconnect and return over and over again is its own testimony to how much fun we were having. Streets of Rogue launched with a free weekend, which enabled everyone to download the release and sample it for several days without having to purchase it first, but the launch contained these sorts of co-op impeding issues nonetheless. Still, assuming that the dev can successfully overcome these hurdles and fix the connectivity issues with the co-op mode [EN: Summoning Runic's Sierra Soliel], Streets of Rogue is exceedingly fun to play with even one other player (or the full team of four). It's even more chaotic, and our group would frequently undo the progress another player had made by inadvertently blowing up the wrong wall or triggering an alarm system. While I would currently issue a word of caution for players picking up this title with the intention of preferring the co-op gameplay to the single-player modes, I hope to see these problems remedied so that I can resume enjoying the hilarious, addictive online multiplayer feature. There's a Local Co-Op mode as well, which seems to run much more smoothly, though the majority of my time was in an online co-op capacity. This is all to say nothing of the single-player gameplay of Streets of Rogue, which is absolutely worth logged hours. You can lose yourself in the randomness of these procedurally generated levels, and gain experience in different character classes while discovering new items. There's a standard set of levels, each with different objectives – and optional, bonus missions if you find an AI character in the level offering one – plus the added challenge of a Daily Run option, which promises Leaderboards in the future. Each time I leveled up, I had a choice of choosing my preference from a list of three different abilities or perks and was able to customize my character for whichever style of gameplay I happened to be in the mood for at the time. Want to do extra damage when you shank someone from behind? No problem! Want to be able to automatically identify syringes so that you don't inject yourself with acid? Sure thing, buddy! That being said, Streets of Rogue is not an easy trek – when you die, you reset back to Level One and lose all of your bonuses and items, effectively creating a perma-death situation. It isn’t for the faint of heart, but those set-backs just made me more determined to up my game the next time around. Few titles can rival Streets of Rogue in versatility, variety, and replay value, and that's rare for an Early Access release. The Feature list on Steam says it all: "Lead a gang, free slaves, drink beer, gib ghosts, become a vampire, shrink people and stomp on them. The most insanely varied game ever made." I found this to be true, and the roster of over twenty character types is just the beginning of the wealth of content. Despite relatively straightforward, pixel-style graphics, and 2D, top-down camera views, Streets of Rogue builds upon the nostalgic charm to create a modern, compelling experience. And while Early Access titles often feel like a dubious prospect, this new release is backed by a Dev who is highly active in the community; there’s even a built-in form for submitting feedback right inside the menu screen. Did I mention the weapons are hilarious? We're talking bear traps, ninja stars, chloroform rags, and other unusual choices, all of which lend perfectly to the crazy shenanigans that go on at any given level of this title. 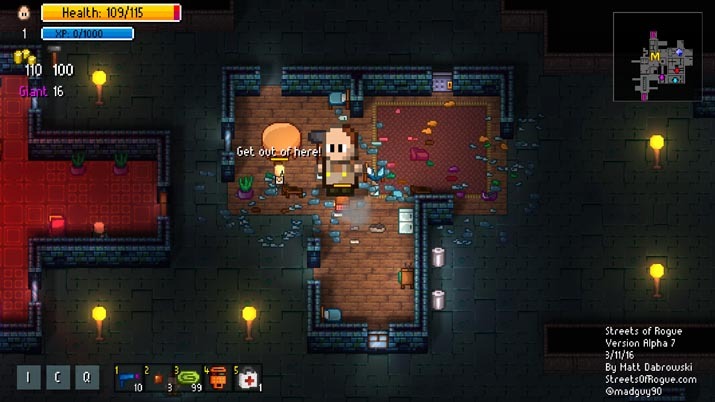 You can rob AI character's refrigerators for healing items (food), rummage around in trash cans, and bust open windows as people peer out at you, then lockpick doors, and hide in cardboard boxes. Go in, guns a' blazing, or sneak up behind someone as a vampire and drink their blood to heal your wounds. The list goes on and on, making the claim that Streets of Rogue is the "world's only RPG RogueLike Action Stealth Shooter Brawler Co-Op Megagame" keenly accurate, and fiercely appealing.